Located in the heart of the magnificent Canadian Rockies, the legendary 4,200 skiable acres of world-class terrain speaks for itself, and Mother Nature does the rest. Set on the east face of the southern end of Mount Allan, Nakiska has 64 trails with four chairlifts set up over an area of 3 square kilometres and boasts 2,555 ft. of vertical. Because of its location straddling the Continental Divide, the 9 chairlift and 120 trails at Sunshine receive more snow than the neighbouring ski resorts. 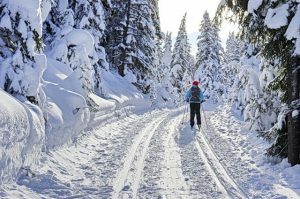 The Peter Lougheed Provincial Park nordic trails are arguably the most scenic and serene trails found anywhere in Canada, boasting over 75 km of groomed cross-country ski trails! Panorama has 1,300 metres of vertical, placing it among the top 3 resorts in Canada! The new terrain opening in 2017 means a new resort distance record for a ski run: over 6.5 km long! Mount Norquay is a popular ski destination and one of the most important ski resorts supporting alpine ski racing in Canada.